After what seems like a very long wait, Microgaming’s Game Of Thrones online slot is finally here; for those unfamiliar with the television series it’s a fantasy epic based on the books by George R. R. Martin charting the fortunes of several powerful families on the continents of Westeros and Essos. Keep reading to find out if this game lives up to it’s inspiration. 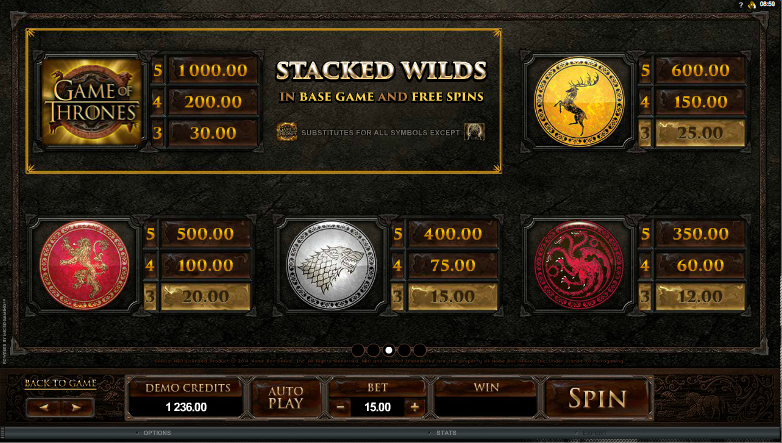 Game Of Thrones is a five reel slot with three rows and fifteen fixed paylines and fans of the show will instantly recognise the music that accompanies your gameplay. The design of the game brings to mind elements of the story such as the Iron Throne of Westeros and the darkness of impending events. Mr Green and 32Red Casinos offer versions of the game with 243 ways to win also. There are four main symbols and these are the seals of the four main families – Baratheon, Lannister, Stark and Targaryen. J, Q, K and A are the lower values. The Game Of Thrones icon is wild and appears stacked both in the base game and the feature and the Iron Throne is the the scatter which triggers that feature. The spins can be re-triggered from within the feature. The gamble feature here is a little more imaginative than the usual fare; you are still trying to double up your win but this is a high quality ‘heads or tails’ mini-game. There are four possible correct moves which correspond to a journey through the provinces in the story. The gamble feature might look nice but we would still warn players to steer clear; it’s still a 50/50 punt which is likely to see you losing in the long run. 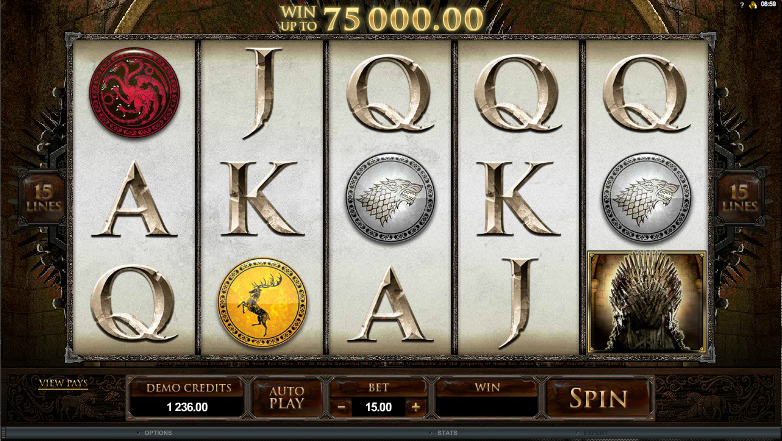 Game Of Thrones looks and sounds really impressive but triggering the free spins round seems a bit tricky. This is a high variance slot though with rare but big wins and it’s in those free spins where the big bucks are. Definitely worth playing if you’re a fan of the show.